Claude Monet’s painting, Woman in the Green Dress, is a full-length portrait of his nineteen year old mistress, and later to be first wife, Camille Doncieux. 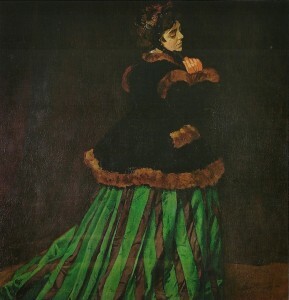 The painting depicts Camille in a green and black striped dress, an Empire bonnet and a fur-trimmed jacket. Monet created the painting in 1866 with The Salon in mind. He had intended to create a monumental Luncheon on the Grass painting but opted to abandon it fearing it wouldn’t be completed in time. Instead Monet worked to complete the life-sized painting of Camille. The painting was accepted into the exhibition and helped to gain the fairly unknown artist some attention. Monet’s portrait was unconventional for its time. The painting’s huge scale was typically reserved for portraits of royalty or distinguished persons and Camille’s movement away from the viewer denies the viewer of an explanation of the context of the scene and situation. Monet is best known for his Impressionist style, however, Woman in the Green Dress was a study in Realism with dark colors, a deep background and much detail and attention given to the fashionable green dress worn by the young Camille. Before becoming an Impressionist painter his early years as an artist were filled with portraits created in the Realist style. When The Salon took place, Monet and Camille were struggling financially. When Woman in the Green Dress sold for 800 Francs, a large amount at the time for a painting by an unfamiliar artist, the couple was elated. Not only did it help them financially but Monet was later commissioned to paint another portrait, Portrait of Madame Gaudibert. Woman in the Green Dress now hangs in the Kunsthalle, in Bremen.